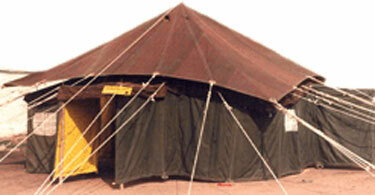 Would you like to have tents, shamiyanas and tarpaulins that are economical as well as last long? By virtue of our long experience in manufacturing tarps and tents, we can offer you any quantity at very cheap price, without compromising on the quality. Your tents will be made under strict quality control standards and are fully guaranteed against all manufacturing defects. If you are buying these tents for an institution or for disaster relief operations, you are welcome to get any special design developed with our active co-operation. Your design will be kept in strict confidence. You can see some sample tents from our wide collection. For any further details, fill up this enquiry form or mail us at goyalka@gmail.com.